Public anger and an air of despair greeted Fisheries Minister Mahinda Amaraweera last Monday when he visited the villagers affected by the Multipurpose Uma Oya Construction Project. He was one of the three members of a ministerial committee tasked with assessing the damage and recommending solutions to the gargantuan problem. The hapless villagers vented their fury, wailing that the walls of their houses kept cracking, their wells fast dried up and their farm lands became arid. After visiting a couple of affected areas, Minister Amaraweera turned up at Udaperuwa, four kilometres off Bandarawela town around 12.30 p.m. It is one of the worst affected villages; some of its houses have collapsed. Perturbed by what they saw as official apathy, Udaperuwa residents demanded from the minister answers to their questions. “Even if you give us alternative land how is it going to help us. We are farmers and need to remain in the area,” an agitated woman told the minister. She said they would become paupers the day the land lost its water. The interaction with the villagers was cut short when JVP provincial councillor Samantha Vidyaratna interrupted. An active campaigner against the Uma Oya project, he demanded an immediate answer from the minister on the fate of the project, while the interaction seemingly took a hostile turn. This prompted the security officers to move the minister out of the area. 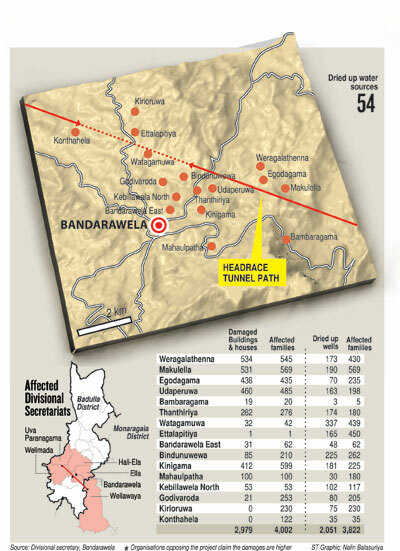 Meanwhile, more than 300 villagers from the affected areas were waiting at the Bandarawela Divisional Secretariat to meet the ministerial committee members and officials after being promised of a meeting. They waited until evening, but none of them turned up. “We wanted to convey our concerns to the ministers, but at the end of the day, we lost even the little hope we had,” Udaperuwa vegetable farmer E.M.N. Dharmaratna told the Sunday Times, expressing his anger and disappointment. Expressing similar views, Ven Kurukudegama Jinananda Thera, the joint-president for an organisation calling itself the Uma Oya Bahujana Winshakari Viyaparayata Erehi Janatha Peramuna (The People’s Front Against the Multi-destructive Oma Oya project) said they waited in hope for a meeting with the ministers to discuss with the ministerial delegation solutions to the problem, but the Government squandered the opportunity. Minister Amaraweera blamed Mr. Vidyaratna for scuttling the meeting with the villagers, but the JVP councillor said the ministers had no answers to the the people’s problems and therefore they made the arguments he had with the minister as an excuse to avoid the meeting. “The destruction is on the expressway while the compensation process is on the slow lane,” Mr Vidyaratna said, pointing out that the situation is fast deteriorating. While the Government suspended the Uma Oya project until a solution is found to the deepening crisis, residents complained that with each passing day, more houses became vulnerable and more wells lost their water. Official statistics released this week show that 2,979 houses and buildings have been damaged with around 1,300 yet to be inspected in 16 Grama Niladhari divisions, but statistics collected by Ven.. Jinananda Thera’s people’s front movement indicate more than 7,250 houses have been damaged. Officials admitted that as many 2,051 wells had dried up along with 54 water sources while more than 3,800 families were directly affected. The people’s front says the figures were higher. Bandarawela’s Divisional Secretary Nihal Gunaratne agreed with the residents that the damage to the houses was increasing with each passing day. He said the authorities were inspecting the damage to provide compensation. Already, the Government had paid compensation amounting to Rs. 160 million, but with the crisis aggravating, more money was required to pay compensation, Mr. Gunaratne said, adding that officials had worked out compensation schemes and evacuation plans. He also said they encountered problems when calculating compensations. This was because that in many instances the damage became bigger days after the inspection. “After we prepare the estimates, it takes around three weeks for valuation officials to visit the place. By the time they visit the location the damage has become worse and therefore the valuation is higher. The people think we deliberately underestimated the damage,” Mr Gunaratne explained. The area’s water crisis also become more acute with each day passing. Drinking water is a major problem. According to a conservative estimate, the daily requirement is around 700,000 litres, but the Sunday Times found out that the authorities only supplied 150,000 litres a day through bowsers — with most people getting water only once a week. 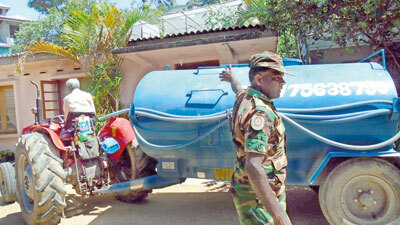 Divisional Secretary Gunaratne said that with some assistance from the project company, they had provided more than 5,000 water tanks to villagers. Villagers complained that the water distributed was insufficient. The capacity of the tanks provided to them is 500 litres. And families are expected to use the tank water for a week until the next bowser comes. “The water is not sufficient even for cooking purposes or to wash the dishes. So how can we wash our clothes? We go in search of waterfalls in other areas to take a bath,” Shalika Maduwanthi, a Bandarawela resident said. Some households buy water from private bowsers, but many villagers cannot afford to buy water. Meanwhile, those in the tourism industry – mostly in the Ella area — say they would be severely affected by the water crisis, with the drought situation also worsening. Executive Manager Nima Nikdel said more than 82 percent of the work had been completed and, therefore, there was no turning back, other than completing the task. He said the multipurpose project was launched to generate hydropower, and provide irrigation water to arid areas. Mr Niktel said the company was confident it could manage and control the situation and had the required technical expertise. He also pledged that the company would continue to support the affected people to ease their difficulties. Amaraweera: Project will resume only after leaks are sealedConstruction work of the Uma Oya project will resume only after the required modifications to the Tunnel Boring Machine (TBM) were affected and the leaks sealed, Minister Mahinda Amaraweera said. He said German experts had advised project officials regarding the modifications and they were expected to complete the repairs by next month before resuming construction. The minister said the TBM needed to be moved about 100 metres forward to seal the leaks. However, JVP councillor Samantha Vidyaratna said work was stopped in 2015 also on a directive from President Maithripala Sirisena, but a few months later, the project was resumed without providing any solution to the problems the people faced. “We hope this does not happen again,” he added. He said the project should be halted forthwith because the cost of the damage caused to the people and the environment was much higher than any benefits the project offered. Hemantha Withanage, founder and executive director of the Centre for Environmental Justice, said the Uma Oya project should be stopped because the cost of the damage far outweighed its benefits. “Due to the crisis, a huge amount of public funds has been spent on providing water and compensations to the affected people,” he said. Mr. Withanage said he believed the project work had been stopped to study how to continue the tunneling process. Commenting on the leakage, he said it happened because the aquifer between the rock and lime stone caves had been breached during tunneling in underground areas with gaps. “Diverting Uma Oya’s water to the arid dry zone of Hambantota is not a feasible task because the water can be provided only for three months,” he said describing the project as a costly exercise with little benefits, just as the Mattala airport and the Hambantota port.Mr Withanage said the project was started on a disputed Environmental Impact Assessment report and no geologist was consulted. The project had already destroyed water sources in Kanndaketiya, posing an existential threat to the sloth bear population in the area. This is a large-scale environmental crisis with soil damage, water pollution and massive deforestation, he said.